To date, four people are officially in the running to become the Democratic candidate for Congress in the fall 2018 elections, according to the Federal Elections Commission. The winner of the Democratic nomination will likely challenge incumbent Republican Lee Zeldin of Shirley, who is, so far, the only Republican candidate to have formally established a campaign committees for a run for the Congressional seat, according to the FEC. This year’s First Congressional District candidates both agree more needs to be done to protect the area’s natural resources, but how the Environmental Protection Agency goes about making that happen is where they disagree. 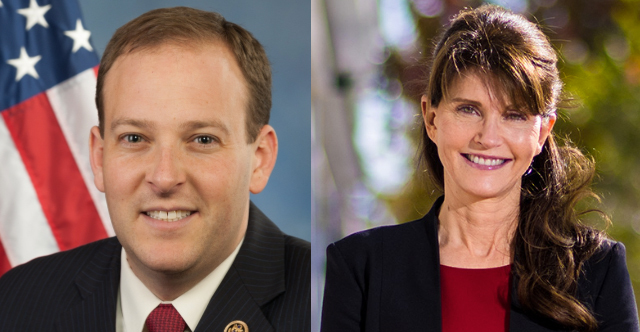 East End Congressman Lee Zeldin and former Southampton Town Supervisor Anna Throne-Holst will discuss environmental issues at Tuesday night’s First Congressional District candidate forum in Riverhead. COURTESY PHOTO | State Sen. Lee Zeldin (R-Shirley) will challenge incumbent Rep. Tim Bishop (D-Southampton) in 2014. State Senator Lee Zeldin, a Shirley resident who lost a 2008 run for Congress and has since served two terms in Albany, will be taking another run at six-time incumbent Congressman Tim Bishop (D-Southampton) next year, as the Republican has the support of party leaders for the 2014 congressional race. Mr. Zeldin, 33, announced his candidacy on Monday morning, launching a website along with a video telling voters why he’s seeking higher office. He earned 41 percent of the vote in his 2008 run against Mr. Bishop, before defeating state Senator Brian X. Foley with 57 percent of the vote in 2010. Zeldin said on Monday that financial issues such as “out of control debt and spending” concern him as a candidate, and working in public office over the past few years has prepared him in regards to the political process and issues. Mr. Zeldin will face George Demos in a primary next year. Mr. Demos, a former U.S. Securities and Exchange Commission lawyer, will be entering his third primary in the First Congressional District after earning just 13 percent of the vote in 2012, and coming in second place with 30 percent of the vote in 2010. County Republican chairman John Jay LaValle said on Monday morning that Bishop will face his “first real challenge in public office” with the party-backed candidate in Mr. Zeldin, adding that no other candidates had been thoroughly considered to challenge Mr. Bishop. He also pointed to a recent investigation by the House Ethics Committee into the incumbent congressman that could prove to benefit Mr. Zeldin’s run.